Josef Jankowski passed away on May 7, 2014. Some time ago, Pete Rushefsky wrote to the list about a tsimbl he had bought from Mr. Jozef Jankowski. Pete recommended Mr. Jankowski highly, so I wanted to get to know Mr. Jankowski and look at his tsimbls and was excited about interviewing him. People often ask where to get good tsimbls in the U.S. and aside from the excellent tsimbls of Kurt Bjorling, Mr. Jankowski is the only professional instrument maker in the US I've come across who makes tunings which are tuned in the traditional "Jewish" (i.e. Witebsk, Belarus/West Ukrainian/Galizian) way. Mr. Jankowski was born in 1922 in Baronovici, Belarus (formerly Poland near Brest-Litovsk) and learned how to make and play tsimbl from his father. Before the war he played tsimbl on Polish radio regularly, with a repertoire which included Polish, Russian and some Jewish tunes. He moved to Florida after the war and has lived there until recently with his lovely wife, who was born in Holland. Just recently, Mr. Jankowski moved to the Buffalo area and has set up shop there to make his very beautiful tsimbls. The tsimbls are usually made with a spruce soundboard on the top, with maple pin blocksand mahogany sidings, which feature an embossed front, making them not only very nice instruments to play, but also attractive to the eye. There are 4 to 5 strings to each course (120-125 strings altogether) and the hammers are of the kind used all throughout Belarus now, which are very short, with a carved "u" for holding the sticks between forefinger and middle finger. 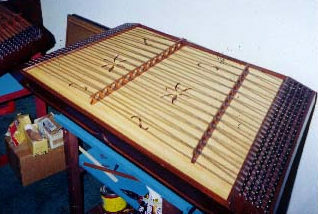 The hammers are short to enable a technique of playing which involves dampeningthe strings with the small finger of the striking hand. The striking surface of the hammers are covered with felt. Mr. Jankowski can also make longer sticks if you want those. Each instrument of Mr. Jankowski is unique in sound. His own favorite has a full, metallic sound, but another one he showed me had a mellow, warm sound. It's impossible to predict the exact type of sound he will achieve with each new instrument, but you can rest assured that the sound will be excellent. The range allows for accompaniment as well as melody playing, though the instruments don't extend into the low bass range, so you shouldn't expect to get that roaring deep cymbalom sound typical of Hungarian/Romanian concert cymbaloms. I found Mr. Jankwoski's tsimbls to be just perfect for playing klezmer music. Maybe this is because his instruments are of the type typically played by Jews before the war, so there is no question as to their authenticity if that's what you're looking for. More importanty, because they are chromatic, you can play any music you want to on them, so they are immensely practical. Mr. Jankowski was a cabinet maker by vocation, so his knowledge of wood and working techniques has a solid grounding. His tsimbls measure 45 x 22 inches and weigh about 35 pounds (very light for the size!). The tension is optimal on the strings, enabling easy playing. 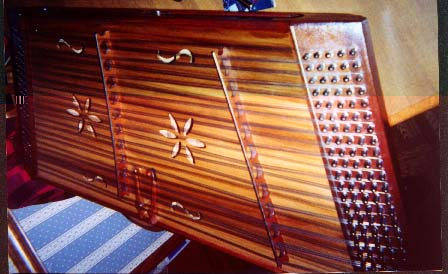 There are typically 6 rosettas (ornamental soundholes), two S-shaped ones at the topleft and right, two at the bottom left and right, and two 6-petalstar-shaped ones in the middle at the left and right. The visuals of the instrument are traditional for the region, except for the lovely embossment's and delicate framing of the woodwork, which is Mr. Jankowski's personal signature. They show the handywork of an experienced and caring craftsman.The instruments cost between 1300 and 1500 dollars at the moment, which I think is more than reasonable. I felt really fortunate to have met Mr. Jankowski and his wife. They are just wonderful people. I also think that people should take advantage of the fact that Mr. Jankowski takes orders for his instruments all year round and only needs about 2 months to finish each one. Other tsimbl makers typically have a 2-6 year waiting list and may not be able to make chromatic tsimbls with such ease and dependability. His price is very reasonable and I think he is extremely important for the tsimbl revival... I'm really happy that there is someone in the US who can now provide us with instruments which are not only wonderful in sight and sound, but also come directly from the hands of a European craftsman who really knows his art. If you have additional questions or need assistance purchasing one, Pete Rushefsky is available to help (not economically involved, just a fellow tsimbler). Posted from text provided by Pete Rushefsky to ensure that information about this wonderful tsimbl-maker becomes more widely available, 16 Sep 2000. Pages copyright © 1995—2018 by Ari Davidow. All rights reserved. Last revised 17 May, 2014.